Melanie Dantés knows the potential of an educated girl. 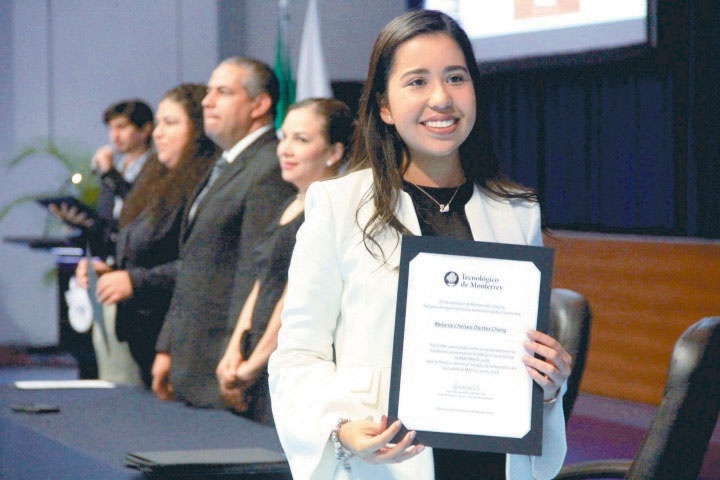 At 17, she already speaks five languages (Spanish, English, French, Chinese and German) and has won “Best Delegate” at several major Model U.N. conferences. But Melanie recognises that many girls in her home country of Mexico don’t have access to the same opportunities. In Mexico, almost one in four girls will marry before her 18th birthday — often ending her education. Latin America is the only region in the world where rates of child marriage are increasing rather than decreasing. Melanie sees the direct impact of high crime rates, underfunding for education and poverty on her peers. I spoke with Melanie about what life is like for girls in Mexico, her work with Violins for Peace and what she hopes to change about her country when she becomes a politician. Luzelena Escamilla (LE): What barriers to education do girls face in your community in Mexico? Melanie Dantés (MD): In the public schools here, I see conditions that are shocking. Sometimes there's no toilet paper in the bathrooms or markers for the boards. It is the government's responsibility to create more access to education. The crime rates here in Mexico are also really affecting the children. I have kids telling me, “I do not want to study. I want to be a narco because narcos have everything. They have a lot of money and they travel.” I do my best to try to make those thoughts go away and explain that with an education they can travel and have a lot of money. It is sad for me to hear the kids think like that. Yet, I know that it is the reality because they are always exposed to that kind of information. (LE): What else is holding girls back in Mexico? (MD): There is a high rate of teen pregnancy here in Mexico. I have seen this a lot. Girls who were my close friends and went to my school got pregnant and were forced to drop out. Conservative ideas also hold girls back. For example, my grandmother is always asking me why I study a lot and travel. She thinks I should stay more at home and close to my family. I love travel because I am able to learn more. But here in Mexico, people believe girls should stay at home. There's a lot of people who still think that way. That is why education is so important — you must teach a girl that she is not limited because she is a woman. (LE): What do think the government can do to improve the quality of education and make it more accessible? (MD): In order to start making education more accessible, the government should start investing more. As I said, the conditions in public schools are not the best. It would also be a motivator for children to attend school if the government would improve access to technology. There are some schools in Mexico that have started to use iPads and that impact children’s motivation and self-esteem. (LE): Tell me about Violins for Peace. (MD): Through the Violins for Peace summer camp, we want kids to explore their talents and we teach them how to develop those skills. We teach them English, French, and basic writing and reading skills. We also play sports such as volleyball and soccer. We also teach them how to play the violin, guitar and piano. We have basic art classes such as painting and drawing. (LE): Why is it so important to provide children with access to music, sports and language classes? (MD): It helps them develop talent they otherwise wouldn’t. They learn what they like to do and they learn to develop those skills. One of our philosophy is if a kid learns how to play violin, that kid is less likely to touch a gun or be part of a local crime. (LE): What is your favourite part of your work with Violins for Peace? (MD): I enjoy working closely with our students. I knew exactly when a student is feeling sad, lonely or having trouble. I love not only seeing the kids learning, but also seeing them really enjoying learning. (LE): You mentioned you want to be a politician in the future. What changes would you make in Mexico? (MD): I do not like politics in Mexico because I know that there is a lot of corruption. That is the first thing that I would want to change. I have friends whose parents are politicians and I have been able to see the other side of the story. I’m sure that a lot of politicians do want to make a change, but they are not able to even if they want to because of others involved or because sometimes their lives get threatened. I would like to stop corruption and create a more transparent government.